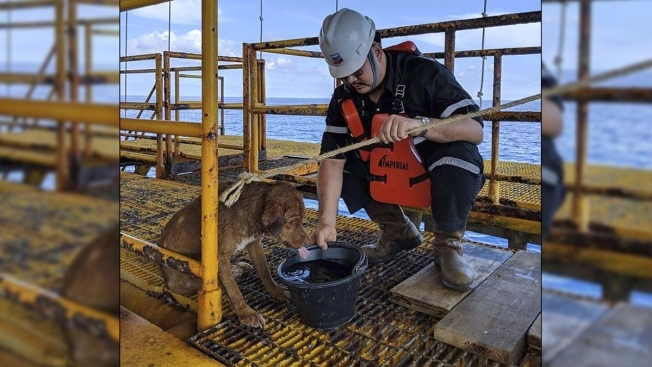 In this Friday, April 12, 2019, photo, a dog is taken care by an oil rig crew after being rescued in the Gulf of Thailand. The dog found swimming more than 220 kilometers (135 miles) from shore by an oil rig crew in the Gulf of Thailand was returned safely to land. Vitisak Payalaw, stationed on the rig belonging to Chevron Thailand Exploration and Production, said on his Facebook page the dog was glimpsed Friday swimming towards the platform, where it got a grip on a pole at sea level. 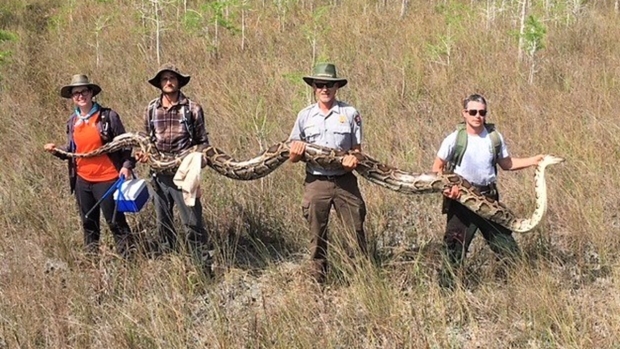 The crew managed to rescue the dog by putting a rope around its neck and hauling it up. He said the crew speculated it might have fallen off a fishing trawler, and dubbed him "Boon Rod," or "Survivor."